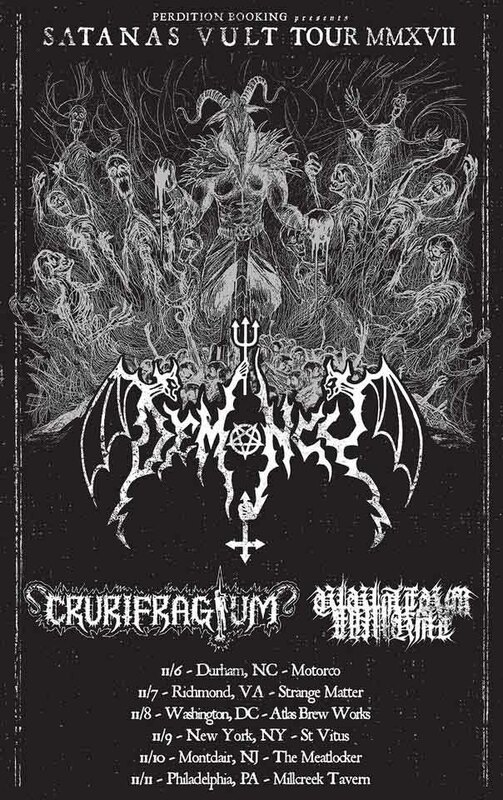 Demoncy, one of the best American black metal bands of all time, is touring the East Coast of America this November. Hate Eternal hits all the notes they intend to. From a technical stance, there’s really nothing missing – an extremely precise instrumental section provides all the velocity and intricacy you’d expect from this sort of death metal. The production and sound is crystalline in its precision, too; all of the important sound frequencies are accounted for, the instrumentation is clear (although like many metal bands, the bassist drowns), and the vocals of Erik Rutan remain suitably midpitched and intelligible for the album’s 45 minute duration. If you wanted to demonstrate textbook “brutal” death metal to your friends and colleagues, a sample from Infernus would leave them more knowledgable about what to expect from the genre, especially if you drew comparisons to Morbid Angel and other well-appreciated bands in Hate Eternal’s long and storied lineage. It’s a shame, then, that such an archetypal album doesn’t make for good listening. It all comes down to the arrangements. The major problem with songs on Infernus is that they drone where they should instead develop, to the point that Rutan’s guitar parts even contain droning tremolo notes and chords buzzing under riffs, hiding ashamed at the edge of hearing. Consider the album’s dynamic range; when your recording is this loud and insistent, your ability to emphasize any one section of your song over others suffers. 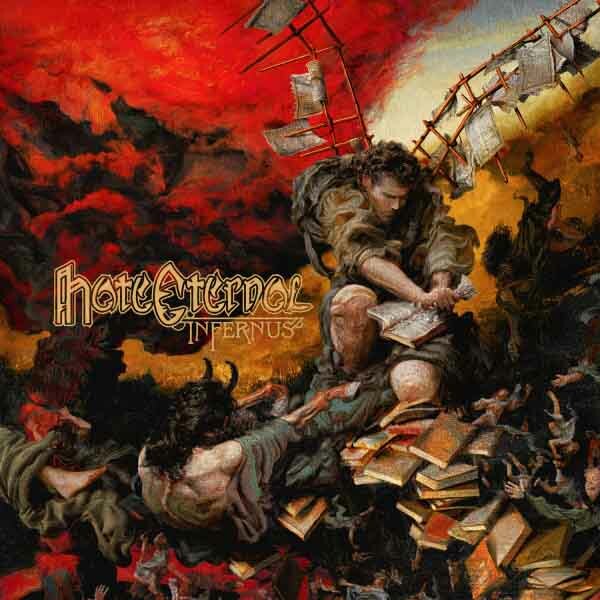 As a result, even when Hate Eternal does pull out a relatively interesting riff pattern (like the outro of “Zealot, Crusader Of War”), it’s likely to pass over without commentary or attention due to listener fatigue. Some might argue that the very death metal stylings of this band justify such a constant aural assault, or that the occasional tempo/rhythm shift or sound gimmick that often performs the role of dynamics in this style creates enough variety, but while such points are worthy of acknowledgement, they don’t exactly help the content. The other half of the drone problem is that songs on Infernus are remarkably conservative about varying their overall structures. I don’t think I’ve heard a death metal band rely on a basic formula so consistently since… well… Death, which had much the same issue with being unable to change up their own songwriting techniques throughout their career, even as their aesthetics constantly evolved. Hate Eternal I am not so familiar with, but the first half of any given track here is interchangeable with the first half of any other. The latter halves offer more room for anything besides business as usual, but if you play a random track, odds it’s going to start by repeating the verse and chorus twice and going straight into a solo. It’s as if the music is not written, but manufactured to government pop standards on industrial machinery… which, in death metal, usually leads to a dismal and forgettable product and makes you more receptive to the next CD on the assembly line. 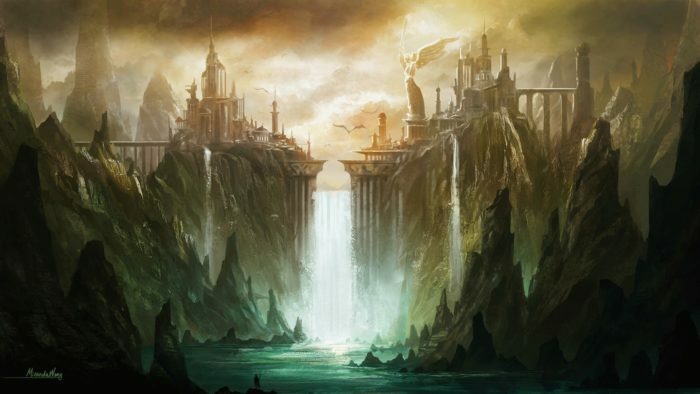 So if there were a conspiracy in record labels to increase sales by reducing people’s attachment to music (which I doubt, because it would require enormous folly beyond what we as a species can muster), Infernus would be the perfect product. In reality, it’s just a technically competent but flawed and unambitious offering; it’s not as obnoxious as, for instance, the thinly disguised technical exercise death metal wave of the mid-2000s, or the metalcore bogeyman in your younger sister’s closet. Nothing that would scare me off from the concert of a band I was interested in, but not something I can earnestly recommend seeking out on your own.